Roots can be a cause of septic system failure. Having trees near your septic system doesn’t guarantee that roots will get in, but it does increase the odds over time. 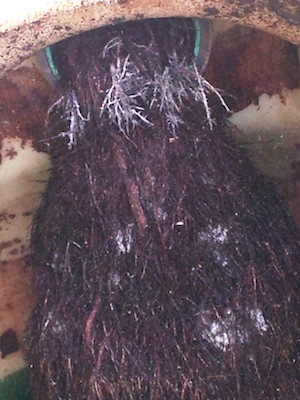 When we cleaned a tank that hadn’t been pumped in approximately seven years, we removed a pile of roots (pictured above) that were growing right through the lid. If the septic tank is pumped on a regular basis, the roots can be cut off and removed, and usually do not create a problem. 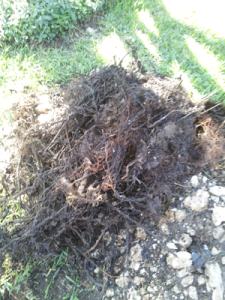 Roots find their way through either the seam at the top of the septic tank, or the seam in the middle. These roots are harder to remove, as excavating around the tank and sealing the tank is usually required. Roots can find even the smallest openings through cracks or at joints in the sewer lines, allowing them a way to enter the inside of the pipes (see photo at right). Although snaking or roto-rootering the lines can clear the inside of the pipes, the roots can grow back if the openings are not corrected. Re-gluing joints or replacing sections of cracked pipes are the best way to prevent them from growing back. Where the pipe meets the concrete of the tank is another place through which roots can sneak in. Excavating the entry point, cutting the roots and re-sealing the area are the best solution. The pipe in your septic system’s absorption area has holes to allow the effluent to seep into the trenches. Roots can enter through these holes and infiltrate the absorption area (the photo at right is of a 10 year-old system). Roto-rootering may allow for temporary relief, but roots usually grow back. Plenty of septic systems can remain functional even with roots in the absorption area. My septic system is 29 years old (past the average life of approximately 25 years), and I have many large oak and cedar trees in close proximity to my tank and drainfield. My tank does not contain any roots, but there are likely roots infiltrating the drainfield pipes that I cannot see, but they are not to the point of causing my system to fail. Roots can grow back even if they are removed and the entrance points have been sealed. Keeping an eye on those areas to catch any root growth early is recommended. In some cases, tree removal may be necessary if root infiltration is causing a problem. If you are considering planting trees, avoid planting new trees near your septic system to prevent problems in the future. Pumping your septic tank on a regular basis can catch root infiltration in the tank at the early stages — before it gets out of control. Not only can you nip a first-time invasion in the bud, your septic pumper will be able to monitor root re-growth. Need to schedule a pumping? Give us a call at 210.698.2000 (San Antonio) or 830.249.4000 (Boerne) or contact us online today.